Running cadence is one of the most commonly used metrics to evaluate running form. It is also one of the easiest ways to go quicker and improve on your running time. Put simply, running cadence is the total number of steps (SPM) you make in 60 seconds. Generally, the higher your running cadence, the quicker you are going. This is because forward movement only happens when your feet strike the ground. The only other way to go quicker is to increase your stride length. While monitoring running cadence can be a powerful training tool, it is not a one size fits all affair. 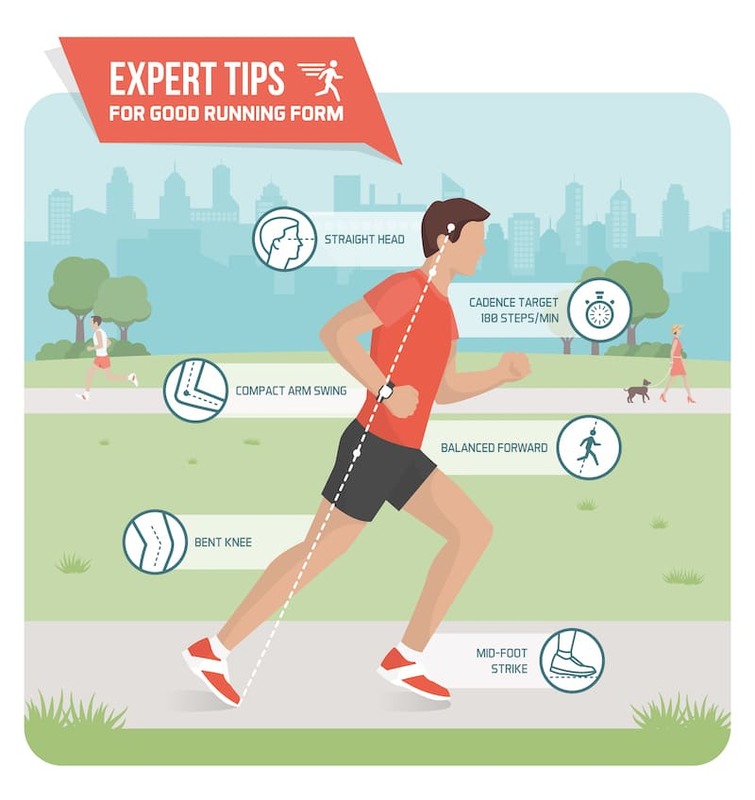 The value you need to aim for depends on your height, weight, leg and stride length as well as your running ability. For example, taller runners will naturally have lower cadences. So there is no one stride rate everyone should aim for. Having said that, research has shown that experienced runners tend to have higher cadence. An often cited target is 180 steps per minute and above. This is because higher cadence is associated with lower vertical oscillation and shorter ground contact time. Every-day runners tend to fall between 160 and 170 SPM while some elite runners can top 200 SPM. While you might not want to aim for a specific number, increasing your SPM has many benefits. It can help improve your running efficiency, it can reduce the risk of injury, enhance recovery and more. This is because increases in step rate can substantially reduce the loading at many places throughout the body such as at the ankles, knees and hips. If you keep an eye on your running cadence, you’ll notice that it changes as you get fatigued. Having variations in cadence between runs and during a run is perfectly normal. To avoid injury, it is best to increase your cadence gradually. And extra two to five steps per minute sounds reasonable. Increases in time and distance should also be gradual. Your body may need between a month and two before the increased step rate becomes part of muscle memory. An even better solution is to work on becoming a better runner by increasing your speed, strength and coordination. If your cadence is too low, you are landing on your heel first which is breaking against your forward motion. You should aim to land your feet closer to your center of gravity. You’ll find that your running cadence will change automatically as you improve your running form. How can I measure running cadence? The easiest way to measure running cadence is to use a stopwatch and tally the number of times your right or left foot strikes the ground in a minute. Then simply double that number and you’ll get your running cadence. Luckily, with the advent of technology, there is now a better way of doing this. Many wearables will automatically keep tabs on your running cadence and display the average value for a run as well as a minute by minute chart on how your cadence changed. Some will also show your running cadence in real-time. The metric is a part of the feature-set of pretty much any self-respecting runners watch. This includes Garmin, Suunto, Polar, TomTom running watches to name a few. Our selection of recommended devices can be found on this link. Even some fitness trackers such as the Garmin Vivosport spit out the metric. The Apple Watch can also be used for this purpose. This is thanks to WatchOS 5 which adds some new features for runners. Your timepiece will now keep tabs on your Rolling Mile Pace, you can set up customer pace alerts, and view your cadence. Depending on what you want to track, you can keep tabs on the current or average cadence on your watch. When enabled it will be shown on the Workouts screen so you’ll know at a glance how you’re doing. Open up the Watch app on your iPhone and tap on the My Watch tab. Tap Workout/Workout View/Outdoor or Indoor run. Tap Edit and select the metric you want to remove. You can only display five at a time. Then simply add Average Cadence or Cadence, as per your preference.